The Refined Geek » Kerbel Space Program: Godspeed You Brave (Read: Insane) Green Men. Kerbel Space Program: Godspeed You Brave (Read: Insane) Green Men. Games without a specific point and I don’t tend to mix very well. I mean we start off well, usually as I follow the main story line, but once there’s a lull I tend to start wandering off in random directions with a trail of destruction in my wake. This is Jerk Mode, the point in which I feel the current game has run its course and all that’s left for me to do is to make every NPC’s life in there a living hell. Many argue that this is the point of these style of games, you can make your own fun in it without having to feel obligated to play it a certain way, but for me once I hit that point that’s it for a while. Of course games that encourage you to do crazy things, like Kerbel Space Program does, tickle me in just the right way and since it’s all about space you know there was no way I was going to pass this up. 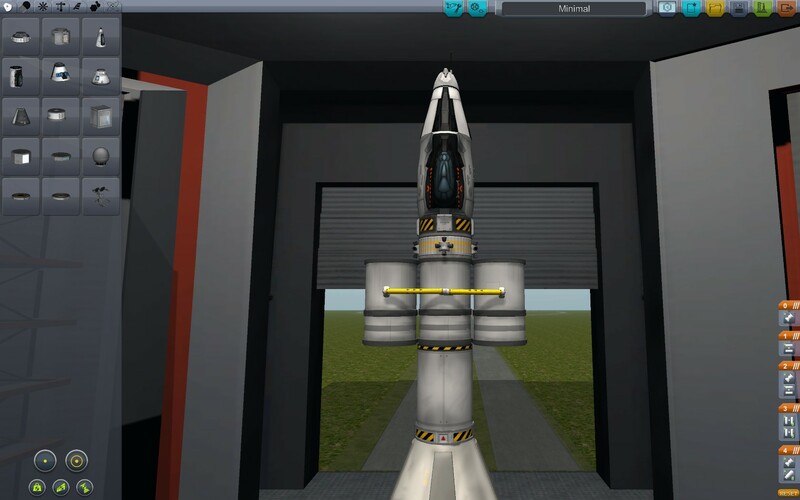 As I alluded to earlier Kerbal Space Program has no specific goal set out for you (unless you do a scenario), instead you’re given an unlimited budget and parts drawer from which you can create a wide variety of craft for launching your little green men into space. You could say the goal is to do this successfully without blowing them up and indeed whilst it is fun to send wave after wave of green men to their fiery deaths eventually you’ll tire of it and set your eyes on goals that are quite challenging to achieve. Even once you do that you’ll think of other things to challenge yourself and down the rabbit hole you’ll go. Kerbel Space Program isn’t much of a looker, that’s for sure, but what it lacks in the visuals department it makes up for in spades with its simulation accuracy and wonderful background music. I make special note of the music because it’s eerily familiar to other simulation style games, particularly the ones from Maxis like The Sims and SimCity, which gives it this….air about it. It’s hard to describe but it just makes building a spaceship fun (although to be fair that’s fun regardless). There’s a couple short tutorial missions which I’d say are required for you to be able to grasp the basics as otherwise you’re just going to flounder around for hours while you wonder why your spaceship isn’t functioning like it should. It won’t teach you everything. indeed there’s a level of nuance to this game that you probably won’t appreciate until you’re on your 20th ship, but it’s enough for you to start experimenting with various designs. Additionally it gives you the run down on basic orbital mechanics, something you’re going to want to be familiar with after you get bored of making huge explosions. The breadth of ship building components is really quite impressive with nearly all the different kinds of components I’d expect to see in a rocket engineer’s dream workshop. Thus the number of different rockets, space planes and other vehicles you can create is nigh on unlimited and depending on how you building them they’ll all have different capabilities. Initially I simply went for the good old fashioned Russian method of strapping as many of them together as I could, which works well to a point, but after a while I started to refine my designs until I started coming up with things that got the same result without resorting to things that made the simulation engine fall in a screaming heap (which happens when you do things in a really retarded way). Now since there’s no explicit goal there’s really no penalty for failure which can lead you to try all sorts of weird and wonderful things to try and achieve the goals you’ve set out for yourself. I personally stayed within the realms of emulating current production launch systems, at least when I wasn’t deliberately trying to cause explosions, which seems to be one of the best ways to go about it. Checking out the community pages though reveals many weird and wonderful designs that are all quite functional, indeed some far moreso than any of the ones I’ve created. Most of my monstrosities ended up being too big for their own good, usually falling apart before reaching the Karman line, but I eventually managed to settle on a good design, one that started to take me places. There’s few games out there that give you that true sense of accomplishment, you know where after completing an objective you feel like you’ve actually achieved something. Getting a craft into orbit sounds like an easy thing to do in Kerbel Space Program, I mean heck you can strap as many boosters together as you want, but therein lies the rub: brute force probably isn’t going to get you there. No in order to achieve something of that greatness you’re going to have to refine and finesse your design until you reach the point where you’re just able to make it. Once you do that however, things start to get a little crazy. You’ll think that once you’ve gotten into orbit that you’ve done most of the hard work and from here it’s pretty easy to get to anywhere else should you have the desire. From an energy point of view this is correct, once you’re free of the gravity well the energy required to move yourself around is greatly decreased. 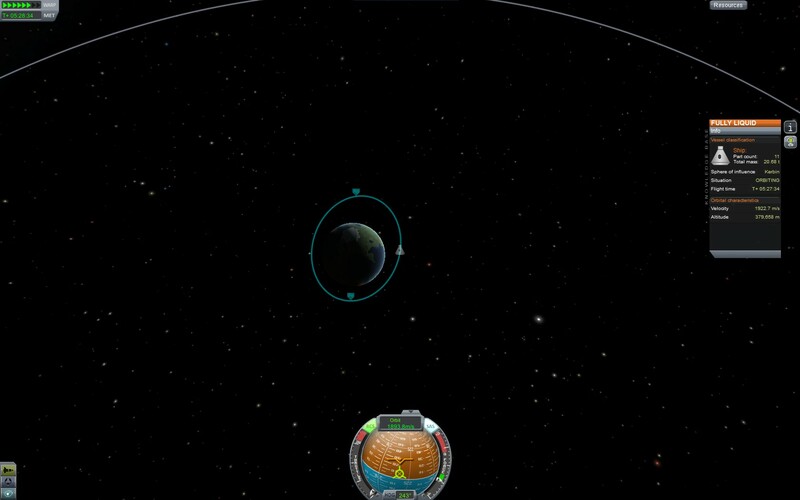 However the first time you make it into orbit it’s quite likely you won’t have any fuel to do anything and even if you do trying to get into a proper transit orbit will likely see you on a trajectory headed into interstellar space rather than the nice transit orbit you hoped for. Of course you’re only a couple clicks away from trying again but it’s really easy to get attached to those craft that have made it to where they are. Of course I’m only talking about a very small sub-section of the game as whilst getting into orbit and transiting around is all well and good there’s also a swath of other things you can do like landing on other heavenly bodies and launching robotic explorers and satellites. 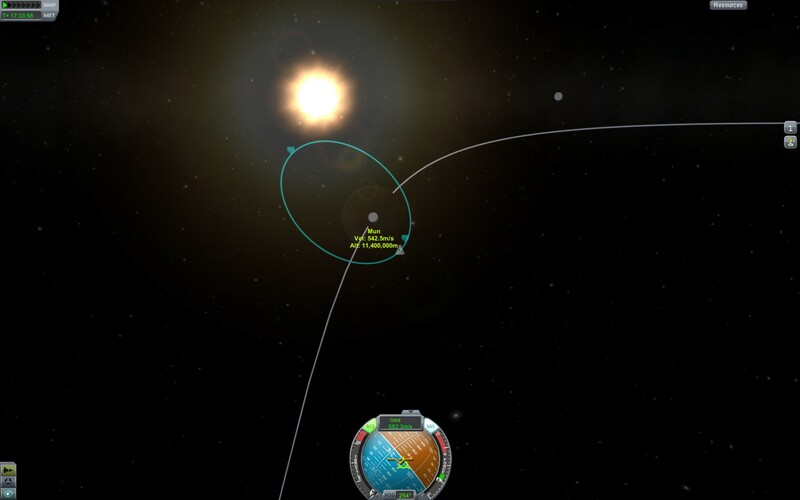 I have to admit I haven’t had a chance to try these out, I was heavily focused on getting into Mun orbit, but jut the fact that the components are there, waiting to be used tells me there’s so much more to Kerbel Space Program than you see at first glance. This is also not counting the modding scene which seems to be incredibly healthy. Kerbel Space Program is still in alpha and so there’s bugs at every corner but since its still in development I can’t really fault them for that. Indeed it’s part of the charm as whilst it does a good job with orbital mechanics and the varying bits of rocket construction sometimes your ship will do things that just aren’t what you’d expect. Usually its emergent behavior from the interaction of so many different components which can lead to all sorts of strange things happening. 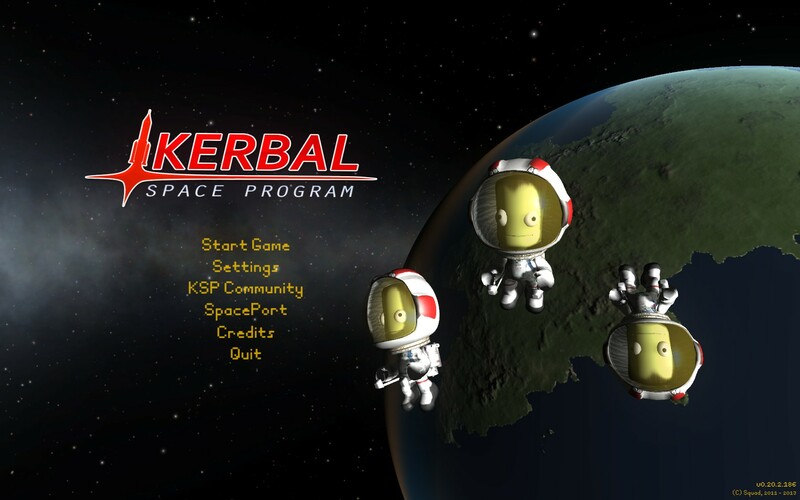 I’m sure as time goes on many of these kinks will be worked out as reading long time fans of Kerbel Space Program shows the game has come quite a long way since it was first released into the world. Kerbel Space Program is one of those awesome little gems where the quirks are what make it fun to play but the nuances of challenges it presents to you are so vast that it will take a lot of time to master. 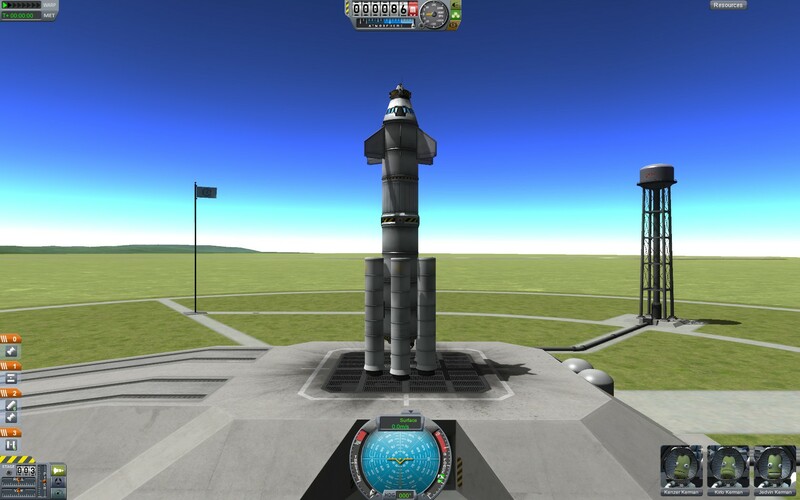 Your friends might not understand why it’s such a big deal that you got into Mun orbit, nor why your 2 stage launch system is a marvel of engineering, but you will and all of us fellow Kerbers will too. I’m far from done with Kerbel Space Program, indeed this is a game that I want to watch grow as it goes from plucky indie alpha to (hopefully) a fully fledged rocket building and launching simulator. It’s not for everyone, that’s for sure, but if you’re even the slightest bit curious about it then you know what you need to do. Rating: withheld due to alpha status. Kerbel Space Program is available on PC right now for $20.69. Total time spent playing was approximately 5 hours. Pingback: The Refined Geek » MirrorMoon EP: For All The Worlds Left Uncovered. Pingback: The Refined Geek » Planetbase: They’re All Dead and It’s All My Fault.